Broomieknowe's Hannah Darling, the youngest ever Scottish U18 girls champion at the age of 13 last year, achieved another milestone at Fulford Golf Club today. She won the first ever R and A Under-16 Open girls tournament with scores of 74, 72 and 72 for a four-under-par aggregate over the par-74 lay-out at the Yorkshire venue. Hannah, pictured, was lying second to long-time leader Beth Coulter (Kirkistown Castle) from Northern Ireland until the Scot enjoyed a four-stroke swing in her favour at the very last hole in the 54-hole tournament. Beth ran up a triple bogey 8 by going out of bounds at the 18th while Hannah birdied the hole by holing a 40ft putt for a 4. Coulter finished with scores of 69, 73 and 78 for 220 - two shots behind Darling. The Northern Ireland girl had done enough to win the Under-14 category by four strokes. Grace Crawford (Gullane) finished second in the Under-12s section with scores of 80, 77 and 79 for a total of 236 - one shot behind the category winner, Rosie Bee Kim (Buckinghamshire) who had scores of 81, 73 and 81 for 235. 220 B Coulter (Kirkistown Castle) 69 73 78. 248 I McDonald-O'Brien (Lilleshall) 86 85 77, C Noja (Sandy Lodge) 84 82 82, M Whitehead (Close House) 81 82 85. 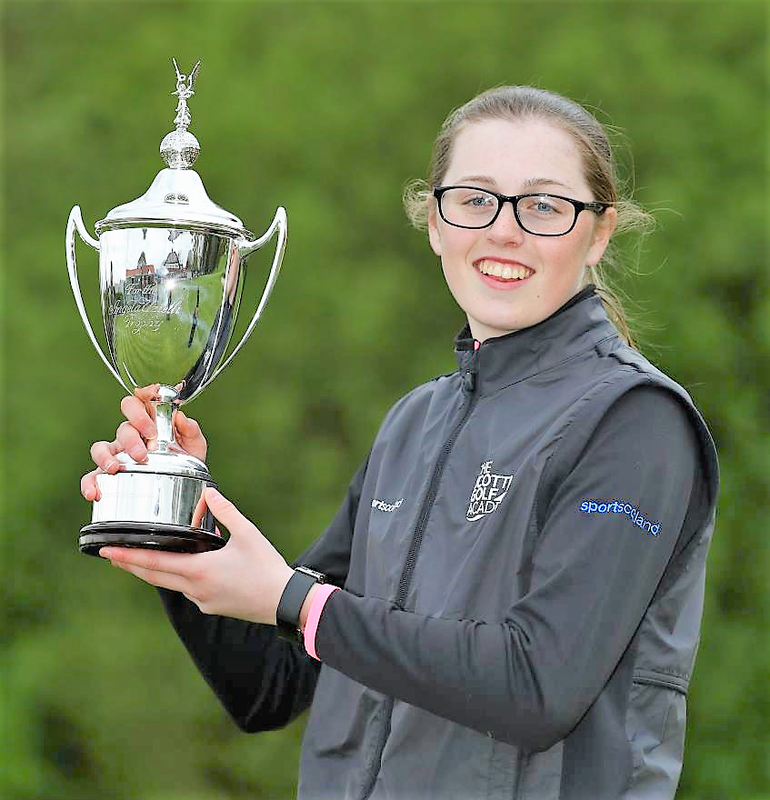 Scotland’s Hannah Darling holed a closing 40-foot birdie putt to seal a dramatic victory in the inaugural Girls Under 16 Open Championship at Fulford Golf Club. Northern Ireland’s Beth Coulter, pictured, had looked set for a wire-to-wire victory in York when she led by a stroke with the par-5 18th to play, only to go out of bounds after her second shot hit a tree leading to a triple bogey 8. Darling had applied the pressure after a closing two-under-par round of 72, only one of two players to post a score under-par on a breezy final day, had given her the clubhouse lead on a total of four-under-par. In challenging conditions, the 14-year-old Darling fired four birdies in the last ten holes to make a surge up the leaderboard. The Broomieknowe player looked on as Coulter’s hopes ended in disappointment after signing for a final round of 78 to finish two strokes back on two-under-par and land Darling another championship win to add to the three domestic titles she claimed in 2017. Switzerland’s Elena Moosmann posted a three-over-par 77 to finish on level par in third place. Coulter held a two-shot lead from Finland’s Kerttu Hiltunen and Moosmann overnight but proceeded to drop four strokes in the opening seven holes to give the chasing pack hope. But with Moosmann making back-to-back double bogeys at the 6th and the 7th in the windy conditions and Hiltunen also struggling, Coulter stayed in control. Moosmann moved to within one of the lead after a hat-trick of birdies from the 8th but Coulter’s second eagle of the week at the par-5 11th hole appeared decisive until a pulled drive at the last led to her troubles. There was consolation for Coulter when she claimed the prize for topping the Under-14s section by four strokes from Italy's Charlotte Cattaneo. England’s Rosie Bee Kim, the youngest competitor in the field at only 10-years-old, parred the last three holes to win the Under-12 years section by a stroke from Grace Crawford (Gullane). The Girls Under 16 Open Championship has been introduced as part of the RandA’s drive to boost the girls’ game in Great Britain and Ireland and beyond, as well as provide a pathway to the elite amateur level for leading young players. “I’m so happy. All the Scottish squad members are here, so I couldn’t be happier. I’ve had good performances in the last few weeks but to come here and win is so good. “I dropped some early shots but it was great to fight back and almost make an eagle on the 11th. I was very happy with the 18th, hit a really good putt from over 40 foot for birdie. “I felt for Beth at the last when she went out of bounds. It’s not nice to see a competitor do that, especially one you are quite close to on the leaderboard. “It was a bit of a rollercoaster all the way round. Coming down the last, I wasn’t scoreboard watching so I didn’t know how Hannah was doing. I was actually standing over the ball and said to myself ‘don’t hit the tree and go out of bounds’ and that’s exactly what I did. "It was maybe a wee bit too risky, I should have played out for par. I’ve just got to learn from it and get on with it. It was one shot. “But very well done to Hannah, she deserved it, she played very well today. Unfortunately, it wasn’t to be for me. I’ve only been playing competitively for three years so it was a great learning experience this week." Fulford Golf Club will also host the R and A Girls Under 16 Open Championship in 2019 and 2020.